Sweet local corn is here, and at low summer prices, why not eat it several times a week! This week we’ve got some great recipes to keep summer corn interesting enough to eat every night! Read on for new ideas to kick up your corn in both written and video recipes. those little white hairs. The easiest way to remove those hairs is simply rubbing with a damp towel. We proudly stock corn from both Olathe and the Musso’s Family Farm in Pueblo. Olathe is great but I always come home with Musso’s Peaches & Cream corn for it’s incredible sweetness. The Musso’s have won so many Blue Ribbons at the State Fair they’ve been retired from competition. 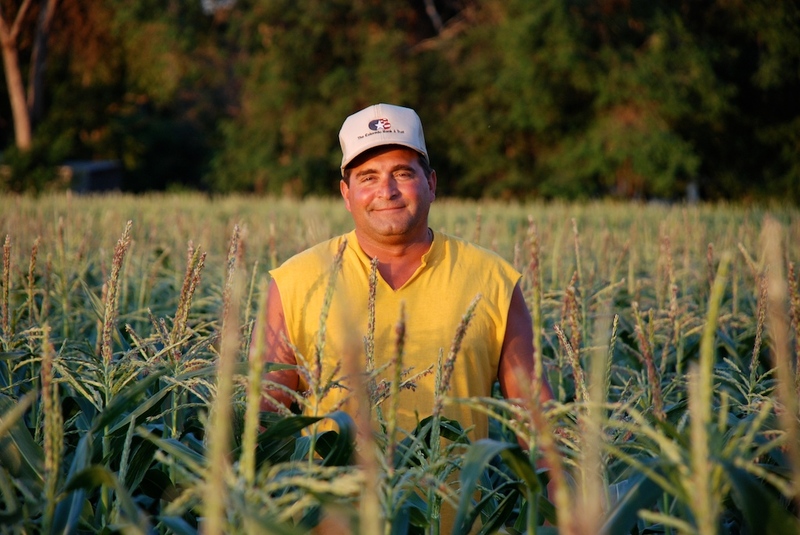 Carl and his guys pick the ears at sunrise every Thursday morning and drive them up to us a few hours later – corn just doesn’t get any better! Carl Musso of Musso Family Farms in Pueblo, 5th generation on the 100 acre family farm. Sweet local onions grown from Vidalia onion seeds. We’ve been buying local produce from the Musso Family since I was a kid! They grow most of our summer vegetables such as green beans, Vidalia-seed onions, spring onions, peas, beets, summer and winter squashes, pickling cucumbers, cubanelle peppers, tomatoes, a variety of melons and the green chiles for our roasts. Every year brings a few new vegetables, I can hardly wait to see what comes each week! Also don’t miss his green chiles, we roast them every fall and keep in our freezer cases while they last. Corn is all about sugar, and when ripe and fresh it the highest sugar level of any fruit or vegetable. I’ve consistently measured Musso’s corn at 16-18° brix (the same as Rocky Ford Cantaloupes on a good year) and have had readings as high as but as 24° brix towards the end of the season, now that’s crazy sweet! 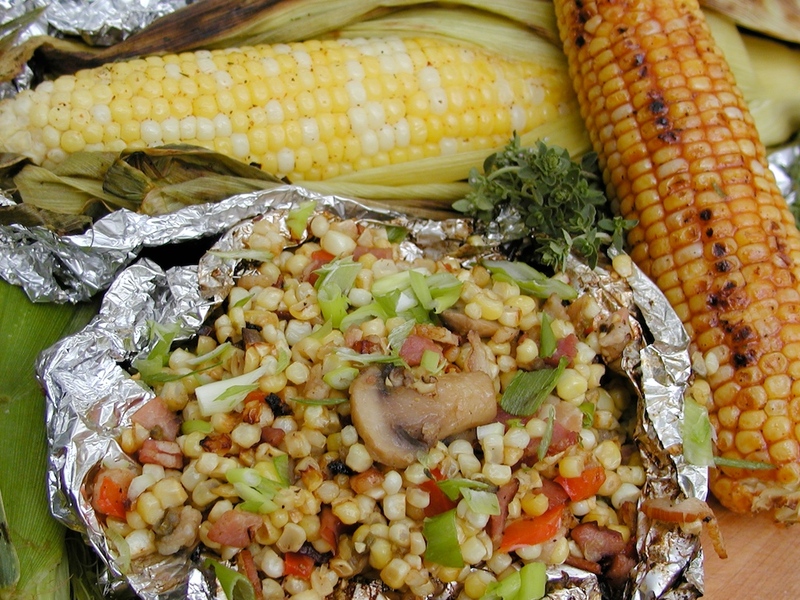 Three great ways to cook corn – in the husk with butter and herbs, toasted on the grill and brushed with BBQ sauce, and en papillote (wrapped in parchment and foil) with other veggies. Carl grows most of our summer veggies. While steaming or boiling fresh corn is a great method, keep in mind the goal is only to heat it through. Well-meaning cooks often overcook fresh corn, diminishing it’s sweetness and texture. Sweetcorn doesn’t actually have to be cooked, the goal is to just heat it through for the ultimate sweet-crispness, generally a few minutes at boil or steam is all it takes. Shuck, mist with oil, sprinkle with seasonings (like our Z Blend, Cajun, Balsamic Chicken Rub, Cherry Ancho Rub or our Lime or Orange Pepper) and grill over direct heat to toast quickly. Season, grill then brush with BBQ Sauce. Pull hull back, remove little white hairs with a wet towel, rub with butter, herbs and seasonings and wrap back in husk and foil for grilling. 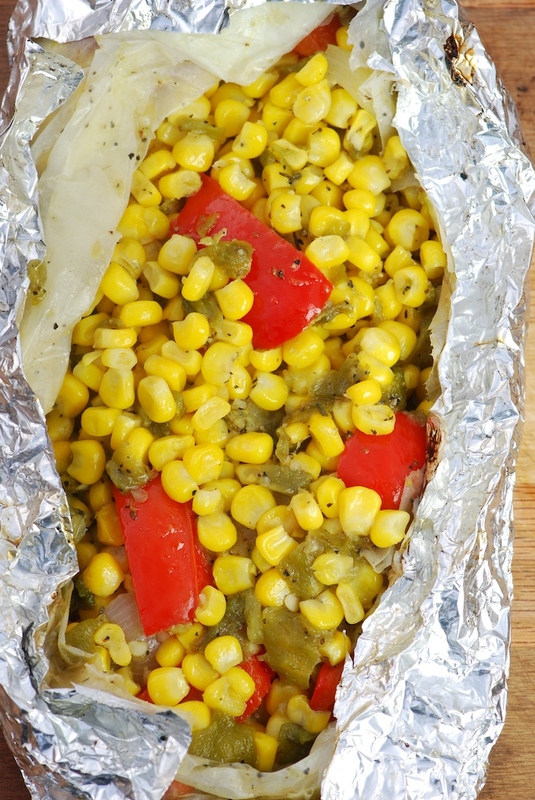 Cut the kernels from the uncooked cob, blend with other veggies, a little butter and seasonings and grill in a foil bundle (en papillote). Season and toast on the grill, then remove kernels for salads, salsas and garnishes. Brush with oil or butter, sprinkle with a zesty Southwestern or Cajun seasoning, grill, brush in butter again and immediately roll in crumbled goat cheese or grated cheddar – lots of different seasoning and cheese options. Cut kernels from corn. Using the back of a knife, scrape the cob to extract the milk and add to the corn. Divide corn into two batches. Puree two cups of the corn with 1/2 cup half and half. Melt butter in a saute pan, add pureed corn, remaining corn kernels, cream, remaining half and half, cayenne, and salt to taste. Simmer until thickened. Reshape Tony’s Crab Cakes into smaller croquettes or patties and roll in panko crumbs. Saute in a heavy skillet with butter, olive oil or a combination – cooking until nicely browned on each side. Separate creamed corn into attractive flat bowls, topping each with a browned Crab Croquette. Garnish with chopped green onion and tomatoes. Directions: Break bread into small pieces and moisten with milk. Add remaining ingredients and combine well.